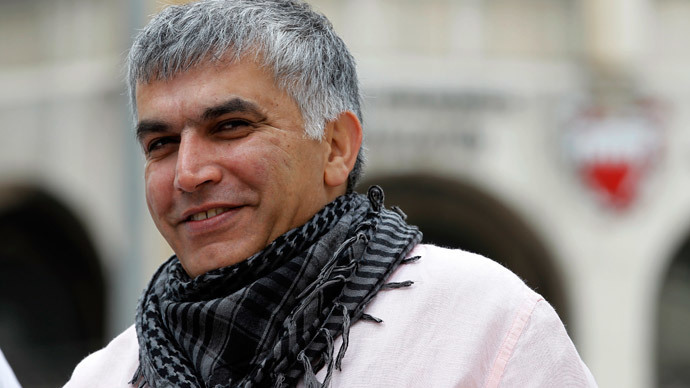 Nabeel Rajab says he fears arrest after receiving a new summons from the police. In an interview with RT, the prominent activist reveals his concerns about the opposition may be silenced in the Gulf Kingdom. RT:Mr. Rajab, tell us about this new case against you. How strong is it, and what outcome are you predicting? Nabeel Rajab: Well, this is a new case out of series of cases being against me in past five years. I think it could be the eighth or ninth case against me. I don’t know yet. I haven’t gone to the police station. I just received it and it said: you have to come now. I could be arrested at any time. It’s less than one year since I was released. And I spent two years in jail. But it’s the cost for struggle that we are doing in this part of the world with the country with old oppressive regime, country that does a lot of crimes and violations against own people, with silence of international community. I can assure you that it would not stop me doing my human right work as well as would not stop any human right defender in this part of the world. Unfortunately, almost all the human right defenders are behind bars. A few are left outside the country. I don’t know whether I come back or not when I go to the police station. Most likely I won’t come back but again. This is the cost of the human right work we do and we will continue. We will not stop. RT:How is it different from the previous cases? NR: All of them are about freedom of expression, some of them are about my Twitter and this may be about speeches I made, interviews including ones with your channel or about peaceful protests I took part in. I have spent years either banned from traveling or in jail. I am not a part of any organization, violent, or armed or opposition. I am a human right defender who doesn’t have anything other than his pen and his tongue. I only speak and write. RT:What about the opposition in general – or is it an individual battle? NR: Bahrain government wants to stop all kinds of political activism, opposition, all human rights movement. Al Wefaq [party] is a political society that represents at least 50 percent in the Bahraini population. Now they are going to stop that and there will be no more political opposition in this country, no more human right work in this country. And this comes with the support of the Saudi government and some green support of UK government. The government tries to marginalize people and forces a lot of people to leave the country. It’s a very dangerous game that could have consequences. It is happening with the silence of the international community, which is very disappointing.